Helpdesk express | What Car? 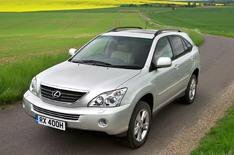 Christopher Clare is concerned by the rate at which his Lexus RX400h gets through brake discs. Hes found they need to be replaced every 19,000 miles or so, when other cars he has owned have gone as much as 70,000 miles without needing new discs. The dealer says the rate of wear is normal. In theory, the regenerative braking system on a hybrid such as the RX400h (which helps charge the battery) should reduce wear on the discs, so were surprised they are wearing out so soon. Wed suggest getting another dealer to check over the braking system and provide a second opinion. The new VW Scirocco that Calum Dobbie has ordered has arrived at the dealership, but theres a blob of paint on one of the doors. The dealer says it can respray the door or Calum can reject it. If he keeps the car the dealer has offered three years free servicing by way of apology. Provided the respray matches the paintwork on the rest of the car, this is the option wed go for. Sue Beckinsale wants Vauxhall to contribute to the cost of repairing her Vauxhall Astra Twintops engine, but the company has refused. The car was registered in September 2006, so is out of warranty, but has covered only 22,000 miles. Despite the low mileage, its unlikely that Vauxhall can be persuaded to pay for repairs on a five-year-old car.